This was going to be my first race for 2015 & six months after my last one. Coach 2 sold it to me in January in misleading way (Coach 2 disagrees with the fact that it was misleading). She said that it was a lovely location to go & race, Lainston House Hotel, Winchester, & that there was falconry as well as a hog roast to finish with. 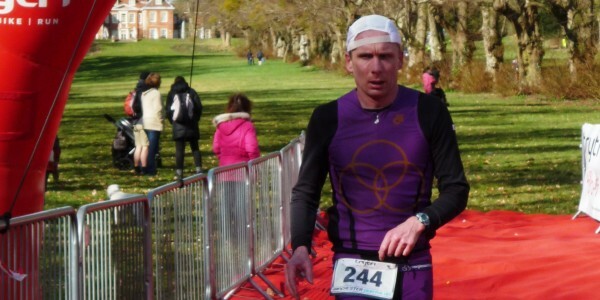 Personally I was looking at it in a completely different way as I wanted to test out some new kit & to see how my winter training had been going & this duathlon seemed to fit the bill. It was a 5K run, 21K bike & another 5K run. A 4:45 alarm call, which was a bit of a shock, with the aim to leave the house by 6am however, we arrived not early enough to reccy the bike course but this was not a major concern as I am familiar with the local terrain. Registration took a little bit longer than normal because there didn’t seem to be any system at the desk & the queue was way down the road however, once I had registered we walked the half a mile to transition & set everything up. I took a bit of time deciding on which clothing to wear as there was a bitter north westerly wind blowing, so eventually decided on base-layer, race top, a good quality Synergie wind-stopper (thank you Scott & Di) & one pair of gloves for the run as well as another pair of gloves for the bike ride. The first run was a 5K, 2 laps which was mostly off road & not the best of running conditions as the ground was not soft & springy but very hard & dry with ruts & lumps. It was quite a tough run with a steep climb from transition, another climb through the fields but a reasonable descent towards transition. My first run wasn’t that good as I was being a little bit cautious. T1 was a bit slower than usual as I wanted to be prepared for the weather. The bike course was a 13 mile loop which was a mixture of country roads & a little bit of main road & quite a few good quality climbs which I liked – at one stage I felt like Richie Porte climbing on the final stage time trial of the Paris Nice (but only just a little bit slower!!!). Overall, the bike ride went OK.
Now out onto the second run, which was a repeat of the first, & as I knew the course by then I seemed to relax & the run seemed much easier. My only concern was would all the cyclists I had overtaken on the bike ride overtake me on the final run!! but to my surprise, only one managed to come back & overtake me, so with a strong downhill run to the finish – job done. So overall, not a bad way to start the season, but there were a few little issues that I need to look into.